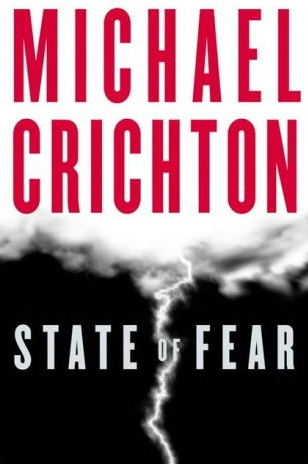 I finally got around to reading State of Fear by Michael Crichton. Interestingly, my son was assigned this book as a summer reading assignment (I'll follow up on that shortly). So I read it, too. There have been many people who have reviewed and criticized the book. This is the first of a series of posts that look at particular claims and issues raised in the book as I see them. Enjoy. Nobody knows how much warming will occur in the next century. The computer models vary by 400%, de facto proof that nobody knows. But if I had to guess--the only thing anyone is doing, really--I will guess the increase will be 0.812436 degrees C. There is no evidence that my guess about the state of the world 100 years from now is any better or worse than anyone else's. That is not true. His guess is not as good as anyone else, any more than if I predict unemployment will be 5% three years from now, my guess is as good as professional economist's. His guess is NOT as good as estimates based on actual science and modeling. That's not to say those estimates will not be improved over time, but to suggest that picking a number out of the air is somehow equivalent to the output of a highly calibrated supercomputer is just hubris and bluster. Secondly, he fails to note (or realize?) that the reason the models differ by a factor of 4 is not because we don't understand the science. It's because we don't understand humans, and what we will do. That's the hardest part to model. Given a particular emissions pathway, the model estimates have a much smaller range of uncertainty. Only by including the wide range of emissions scenarios do the models show such a wide range. Note how each color band is not that wide. Those are the bands of uncertainty for each emissions scenario. Unfortunately, his book and the assertions of others who share his views (or even more vehemently deny climate change) are putting greater certainty on the higher emissions scenarios, reducing the uncertainty, but in a bad way.